Exams are so exhausting, especially if it is your semester exams. The amount of energy that you put into exam preparations are so draining that you need to refresh yourself to start your next semester effectively. Generally students prefer to go for some industrial visits or implant training programs. But doing so the opportunity to learn new technologies for you will be relatively less, as you don't get to do anything hands-on by visiting the industries. So if you would like to learn new technologies and get skilled at the same moment, joining winter training programs are a very good choice for you. These programs not only help you to learn new technologies but also gives you a platform to build innovative projects and have fun at the same time. What are the training programs that you should undergo? Before we go further, it is essential for you to identify the latest technologies in your field. topped the list and these are the fields that are more related to your core engineering. So, taking up training programs on these topics will help you to develop a better understanding of them. Reports state that IoT industry is going to transform into a multi-trillion dollar market by the year 2020. And there will be a great demand for engineers who can work on this latest technology. In this project-based training, you will learn about the theoretical concepts behind IOT and you will then implement the knowledge gained to build 2 different projects on IOT. Weather Monitoring System: The project that you build can record the temperature/ humidity changes in the environment and send out an email notification to a remote user. You can also store the data on cloud and analyze it for further implementations. Smart Irrigation System: The project that you build facilitates the automatic switching On/Off of water pump based on the moisture level present in the soil. 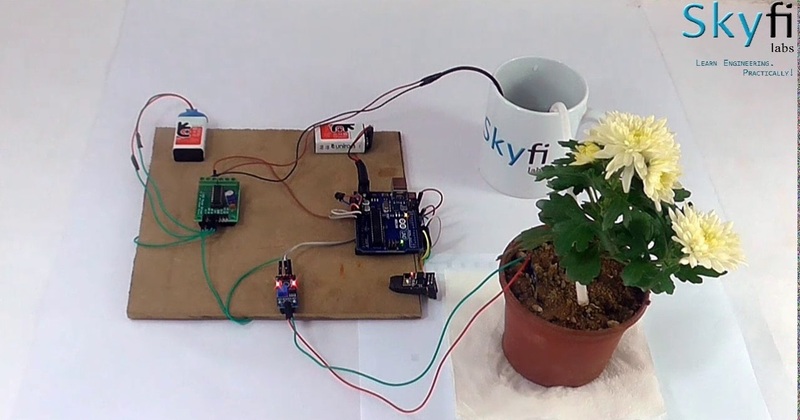 You will use a soil moisture sensor to detect the moisture change and the system will send the data to cloud for storage and analysis purpose. If you are serious about having a career in the field of Internet of Things (IoT), then this is the right course for you to learn and begin your journey. This winter training program helps you to learn IoT by building projects and implement the knowledge gained to develop industrial grade projects. Smart energy systems are technologies designed to optimize storage, distribution and efficient usage of energy. As the energy demand is increasing day by day, more industries are starting to implement these technologies to meet their energy requirements in a smarter way. Through this winter training program you learn the theoretical concepts behind the smart energy systems and use the skills gained to develop 4 different projects on it. Home Automation System: Through this project you will develop an electronic device that can be used to control all the appliances via Bluetooth technology. You will use an Android App to integrate the devices and control them. Smart Lighting System: The project that you build can detect the presence of humans in a room and facilitate the automatic switching On/ Off of lights, so as to save lot of energy. Solar Mobile Charger: This project is an application of solar energy. The device that you build can trap the solar energy and facilitate the charging of your mobile phone. Smart Traffic Lighting: The project that you build can sense the traffic intensity with the use of IR sensors and controls the traffic signal automatically. You can also use the solar charger that you built to power up this device. If you are passionate about embedded systems then this course will be an ideal platform for you to learn and get skilled in it. Especially if you are in your 3rd or 4th year, then this is a must do training program for you. Since you need to develop academic projects, the knowledge that you will gain through this training will help you to develop innovative engineering projects. This winter training program on Robotics helps you get started in Robotics domain and gives you the skills needed to build your own Robots. You will learn the theory, understand the working and usage of various sensors and learn programming of microcontrollers. You will then implement the skills gained to build 7 different types of robots. If you want to pursue a career in the field of robotics then this course will be the right choice for you to learn all the basics and get skilled on technologies. You will not only learn the theory behind robotics, you will also develop skills in wireless communications, microcontroller programming, embedded systems and sensors working & calibration. What can you do other than electronics engineering winter training programs? For some reasons if you are unable to attend any winter training programs, you can still improve your skills by building projects on latest technologies hands-on. Although building projects is tough, you can ease of that by enrolling for some online courses/ project-based courses to get the initial guidance and support. To help you in this, we at Skyfi Labs have developed some amazing online project-based courses that make learning by building projects super easy for you. You can simply select the course of your choice and register online and we will send you the hardware kits & provide online content/ support to help you complete the project within your winter vacation. It's that simple!